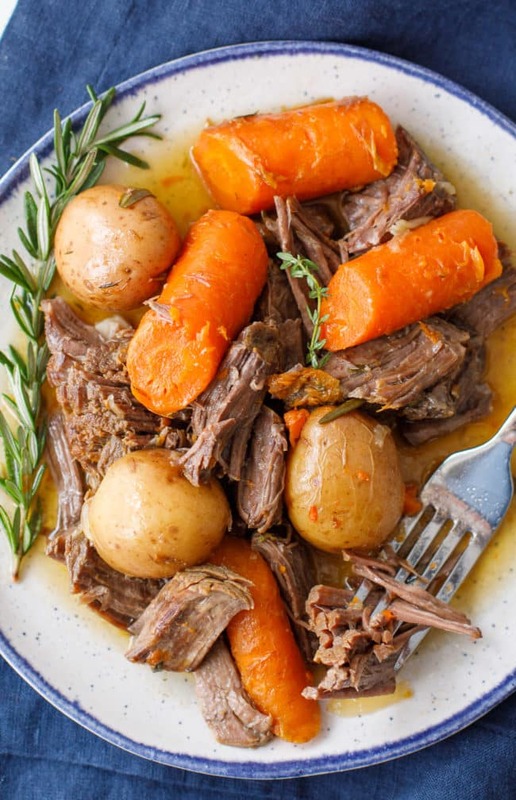 This Instant Pot pot roast recipe is fall-apart-tender and totally delicious. 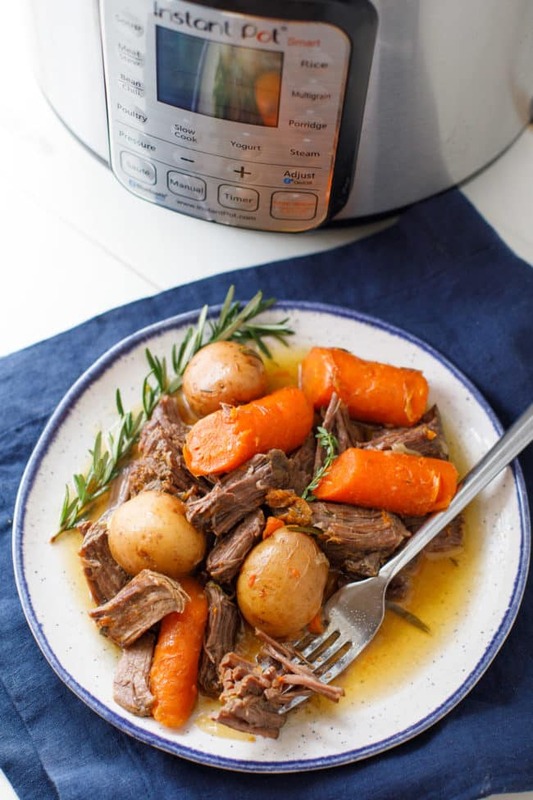 Whole baby potatoes, carrots, and fresh herbs come together to make the perfect pressure cooker chuck roast! This is actually the recipe that made me fall in love with my Instant Pot. Now that I know I can make an Instant Pot chuck roast that’s so delicious in such a short time, there’s really no going back. In fact, my beloved slow cooker may be collecting a little dust lately as I tend to reach for my Instant Pot more often these days! With easy family meals like my Instant Pot taco soup or this easy Instant Pot white bean soup, it just makes sense. Pot roast is a meal that my whole family loves, so I whip-up this easy pressure cooker beef roast about once a week. It’s a great dinner for my family of four, and I usually have plenty leftover to send with my husband to work the next day. Isn’t it funny how some meals almost taste even better the next day? I know that my husband always appreciates his day-two pot roast leftovers. Ever find yourself at the meat counter wondering what cut of beef to buy to make a pot roast? For me, it’s all about the chuck roast. An Instant Pot chuck roast turns out so incredibly tender and scrumptious that this is the beef roast I choose again and again. I like to make my Instant Pot chuck roast with potatoes, carrots, and celery. However, you can certainly get creative and try other vegetables. Green beans would be delicious, and I’ve also used turnips successfully. Do you have any favorite veggies to throw in the Instant Pot with a roast that I haven’t mentioned? I’d love to hear how you make yours at home! 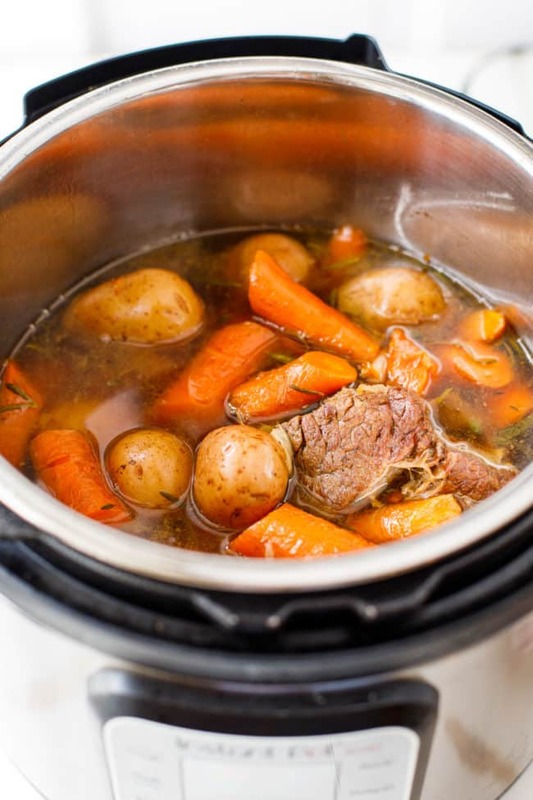 Wondering if you can cook a frozen chuck roast in your Instant Pot? Well, the short answer is yes! The long answer is a bit more complicated. Please note that your results will be much better if you used a thawed piece of meat, but, I know that sometimes you really want to make a pot roast and the only meat you have on hand is frozen. Been there, done that! If you do decide to cook a frozen chuck roast, you’ll want to add about 5 extra minutes per pound of cook time and skip the searing step. Since you’re adding so much cooking time, I would suggest doing a quick release after the first 70 minutes, then adding the vegetables, and cooking on high pressure for an additional 15-20 minutes. I make frozen chicken breast in an Instant Pot all the time, but with a beef roast, you will find that the outside cooks much faster. This can mean result in the outer layers being overdone by the end of the cooking time. If you do decide to cook a frozen chuck roast in the Instant Pot, let me know how it turned out in the comment section below. I’m sure that your experience will be really useful for our other home cooks. Choose the chuck roast, trust me! Leave your potatoes whole! They turn out just right using this method. Larger chunks of carrots will yield better results. You can use baby carrots, but they may be a bit too soft at the end of cooking. BONUS GRAVY: You can remove the meat and vegetables to a serving dish and create an optional gravy with the liquid in the pot. Just whisk together 1/3 cup of cold water with 3 tablespoons cornstarch. Set the pot to sauté, high and let the mixture bubble, then whisk this mixture into the liquid in your pot. Start off with a small amount mixed in then add more if necessary based on the amount of thickening you desire. 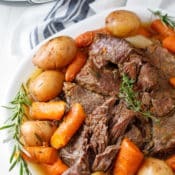 I hope you LOVE my simple Instant Pot pot roast recipe. Be sure to leave a comment letting me know how it turned out for you, and if you made any tweaks to the recipe. We’re all learning together! Don’t miss our Instant Pot pot roast tutorial video below! 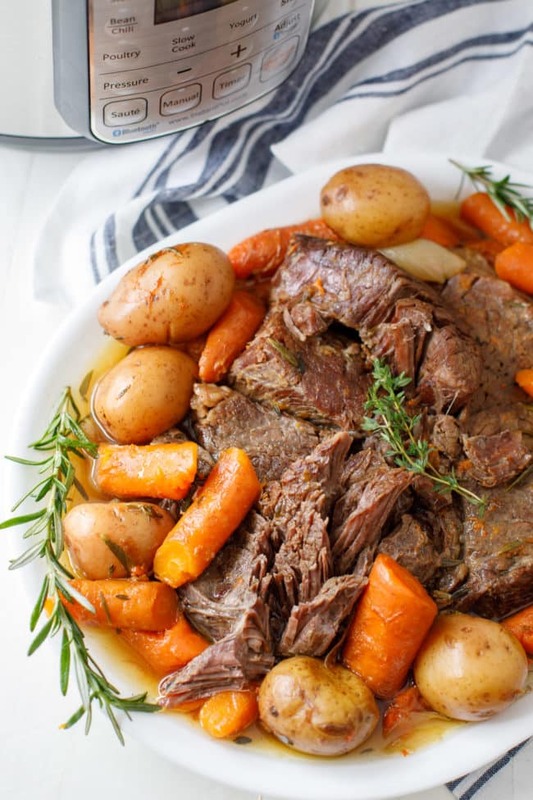 This Instant Pot pot roast recipe will give you a fall-apart tender chuck roast and flavorful vegetables. It’s a lovely Sunday dinner recipe! Generously salt and pepper both side of the roast, set aside. Turn on the instant pot sauté function to more, and add the tablespoon of olive oil. When hot, put in the roast and brown on each side for 3-5 minutes. Pour in the 2 cups of beef broth. Add fresh thyme, fresh rosemary and the onion. Evenly distribute the potatoes and the carrots in the pot. Cancel sauté function. Put the lid on the pot and close the valve. Pressure cook on high pressure for 70 minutes. At the end of cooking allow to natural release for 10 minutes before carefully quick releasing the remaining pressure. The fresh herbs will have mostly fallen off the stems, but, you can shake them gently to help them along before discarding them at the end of cooking time. OPTIONAL GRAVY: You can remove the meat and vegetables to a serving dish and create an optional gravy. Just whisk together 1/2 cup of cold water with 3 tablespoons of flour until smooth. Set the pot to sauté, high, and let the mixture bubble. Then whisk this mixture into the liquid in your pot.